82 The PCB Design Magazine • July 2017 by Alistair Little ELECTROLUBE Resins: Cutting Through the Technical Jargon SENSIBLE DESIGN You only have to visit my company's website to find out that resins come in many forms, with a list of properties that would challenge even a chemist graduate. Well, I do appreciate that most PCB manufacturers have little time to dwell on the subtleties—they just want a resin that will do the job. But with so many products on offer, how do you find time to wade through the jargon, make your choice and be confident that it will perform as expected? 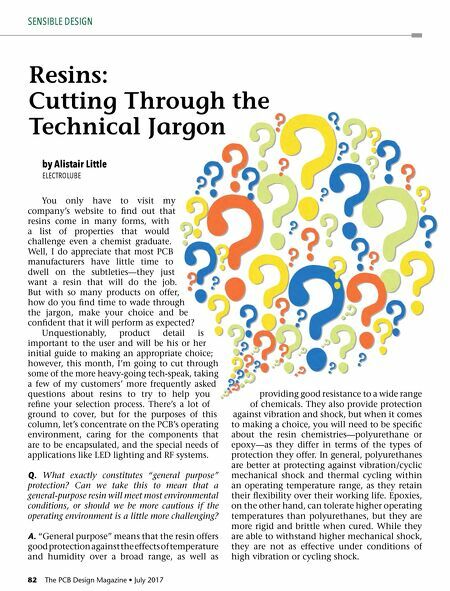 Unquestionably, product detail is important to the user and will be his or her initial guide to making an appropriate choice; however, this month, I'm going to cut through some of the more heavy-going tech-speak, taking a few of my customers' more frequently asked questions about resins to try to help you refine your selection process. 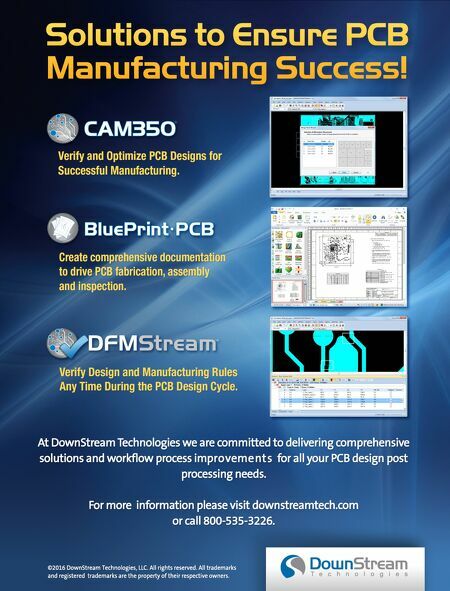 There's a lot of ground to cover, but for the purposes of this column, let's concentrate on the PCB's operating environment, caring for the components that are to be encapsulated, and the special needs of applications like LED lighting and RF systems. Q. What exactly constitutes "general purpose" protection? Can we take this to mean that a general-purpose resin will meet most environmental conditions, or should we be more cautious if the operating environment is a little more challenging? A. "General purpose" means that the resin offers good protection against the effects of temperature and humidity over a broad range, as well as providing good resistance to a wide range of chemicals. They also provide protection against vibration and shock, but when it comes to making a choice, you will need to be specific about the resin chemistries—polyurethane or epoxy—as they differ in terms of the types of protection they offer. In general, polyurethanes are better at protecting against vibration/cyclic mechanical shock and thermal cycling within an operating temperature range, as they retain their flexibility over their working life. Epoxies, on the other hand, can tolerate higher operating temperatures than polyurethanes, but they are more rigid and brittle when cured. While they are able to withstand higher mechanical shock, they are not as effective under conditions of high vibration or cycling shock.